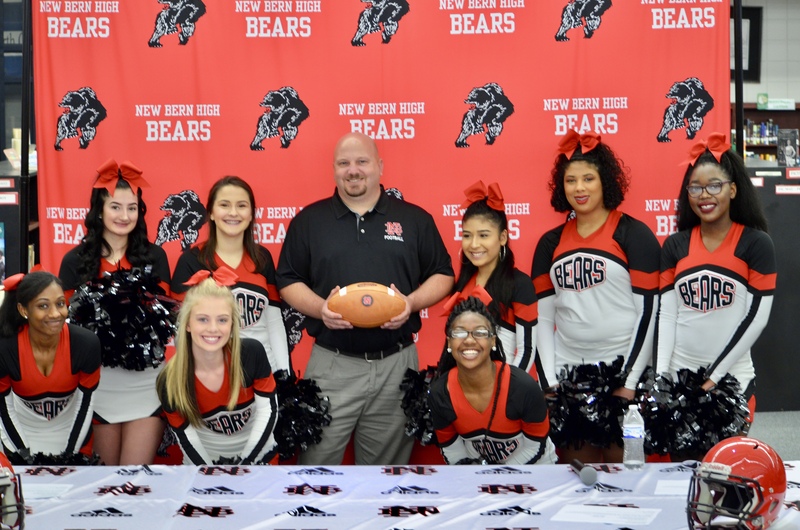 Today during a special announcement at New Bern High School, Steve Tapley was named the new head football coach. Prior to his arrival at New Bern, Tapley coached the offensive line for four years while serving as the Run Game Coordinator, Offensive Coordinator, and Assistant Head Coach under Ron Turner at Wilkes Central High School in Wilkesboro, N.C.
During those years several Eagles posted record numbers. In each season an Eagle rusher gained more than 1,000 yards, with three players gaining more than 2,000 yards rushing. In their most productive season, the Eagles gained over 3,000 yards on the ground while giving up only 6 sacks in 189 passing attempts. Wilkes Central laid claim to back-to-back outright conference titles in 2016 and 2017. The Eagles earned a spot in the NCHSAA playoffs each of his four years on staff. Tapley spent the 2013 season at his Alma-Mater, Bethany College (Lindsborg, Kansas), serving as the Co-Offensive Coordinator, Special Teams Coordinator, and Receivers coach for his former coach, Manny Matsakis. Both the Special Teams and the Triple-Shoot Offense posted impressive numbers during his stay. The 2013 Swede Punt Return unit averaged an impressive 15.9 yards per return, ranking them #3 nationwide. The offense rushed for nearly 2000 yards and had an average of 13.6 yards per completion. In 2012, Tapley coached offensive line and linebackers at Kestrel Heights School in Durham, N.C. His input helped to modernize the offense and special teams units, while securing college scholarships for two players from a program in only its second year of varsity competition. Before moving to Durham, Tapley served as the Defensive Coordinator at Topeka West High School in 2011 where he also served as the school’s Head Wrestling Coach. Under his leadership the Chargers qualified three wrestlers to the KSHSAA 5A State Tournament. Tapley began his collegiate coaching career at Bethany College (KS) in 2004 as the team’s Linebacker Coach and Recruiting Coordinator. The Swede defense ranked in the top 5 nationally in passing yards allowed during the 2004 season. In 2005 he coached the Offensive Line. His coaching career began at Royal Valley High School in Hoyt, Kansas as the Offensive and Defensive Line Coach under Tom Barta in 2001. In 2003 the Panthers secured a berth in the KSHSAA 3A State Playoffs. A native of Holton, Kansas, Tapley was a three-sport letterman and chosen as the most outstanding male athlete of his class. He received all-league recognition as an offensive lineman his senior season. Tapley played collegiately at Emporia State University as a linebacker and deep-snapper. Tapley earned a bachelor’s degree in history and political science from Bethany College in 2006. He has two children, Seth and Spencer.